Drew Greenall scored a hat-trick as Bexhill United Football Club achieved an impressive away victory on Saturday. The tall number nine struck once in the first half and twice during the second period of Bexhill’s 4-0 win against Southwick in Southern Combination League Division One. 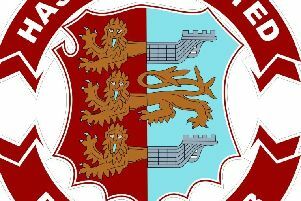 The other goal was a goal of the season contender from Nathan Lopez as Bexhill went one better than their 3-0 success at the same ground in September’s reverse fixture. On a pitch which was slightly wet down the middle, Bexhill passed the ball fantastically well. Craig Ottley returned to the starting line-up and set the tone with some excellent distribution from left-back. Bexhill took a fairly early lead in slightly fortuitous fashion. After a good spell of play, the ball ended up with Greenall, who turned on the edge of the box and struck a looping shot with his less-favoured right foot which looked to be going over but dipped under the crossbar. The goal settled Bexhill down and they were so industrious in midfield, with Jamie Bunn outstanding and Liam Foster showing remarkable energy. Bexhill’s second was in their top three this season, according to manager Ryan Light. Lewis McGuigan played the ball forward over the shoulder of Lopez, who as it bounced up, struck a first-time shot into the near top corner from 20 yards. The visitors were pleased to go in at half time two-up, but were whiskers away from it being 3-0. Ottley played a free kick short to Bunn, who unleashed a tremendous 30-yard strike which moved in the air and cannoned back off the crossbar. Bexhill were on the front foot again right from the start of the second period and caused Southwick all sorts of problems. They did go three-up when Greenall scored his second. Three players went running through, illustrating Bexhill’s desire to get forward, and Greenall could’ve squared for a team-mate but decided to shoot and neatly lifted the ball over the goalkeeper as he dived at his feet. Greenall completed his treble by applying the finish after great work from Jack McLean, who beat two opposing players and pulled the ball back from the byeline to the edge of the six-yard box. Southwick’s goalkeeper pulled off four or five superb saves to keep the scoreline respectable, two of them from Sammy Bunn. Kion Parchmont impressed after making his debut as a second half substitute. Bexhill: Rose; Holden (Robertson), McGuigan, McFarlane, Ottley; J. Bunn, S. Bunn, Foster (Cuddington); Lopez (Parchmont), Greenall, McLean. Southern Combination League Division One top half standings (played-points): 1 Steyning Town 21-53 (+36 goal difference), 2 Alfold 20-48 (+37), 3 BEXHILL UNITED 21-47 (+43), 4 AFC Varndeanians 20-42 (+28), 5 Selsey 20-35 (+18), 6 Hailsham Town 21-33 (+9), 7 Littlehampton Town 20-30 (+2), 8 Seaford Town 21-29 (-4), 9 Wick 20-28 (-7).